In a word... FAIL! My chunky fingers failed me and this tricky skill is best left to the professionals. 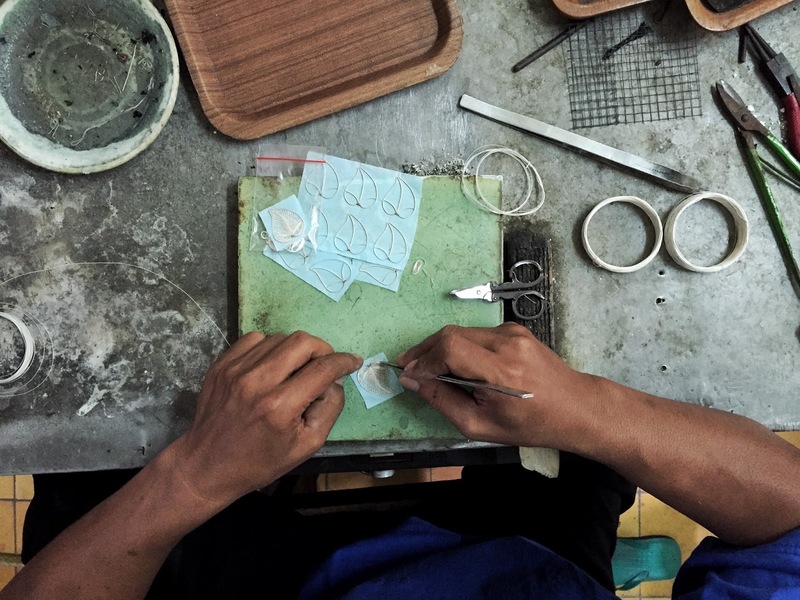 First, we watched the skilled craftsmen at work as they created intricate jewellery and trinkets. They made it look so easy. Next, we were ushered into our workspace where we would be having a go at creating our own silver masterpieces. Everyone diligently got on with the task and it was probably about two minutes before expletives were unleashed and the frustration set in. It was good to know I was not the only one struggling. On the left - what I was aiming for. On the right - my reality. Despite my clear lack of natural talent in the silver department, it was still a lot of fun to try. I wish I could have kept my botched attempt. 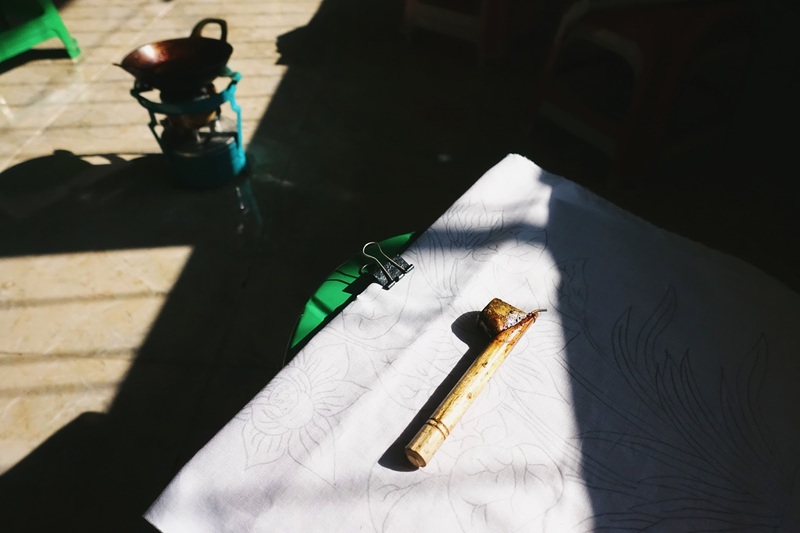 Out of the two activities, learning to batik was the one I was most excited about. I've always loved batik - the patterns, the colours, everything! When we arrived at the Museum Batik, everything was already set up. I felt like a kid back at school, sitting on the low chairs. First we had to draw over the design in wax. The bits that were covered in wax would be sealed and protected when the fabric was dye. When the dying process was complete and the wax removed, they would remain white. It was a bit fiddly trying to get the wax to come out of the 'pen' smoothly without leaving splotches of wax on the fabric. Some people embraced the splotches and incorporated them into their batik design. I embraced the flaws. Once you were done tracing over your design in wax, you had to choose a colour to dye the fabric. I went for yellow. I wish we could have stayed to see the whole process, but we were on a schedule so had to leave them at the museum. We were presented with the finished product at our leaving dinner. I really like mine. It's not the neatest or nicest batik I've ever seen, but I made it. It's a great souvenir to be able to have from this trip. The museum also had a shop selling clothes made from batik fabric, a variety of fabric, and all the supplies needed to create your own batik. I was going to buy a starter kit but talked myself out of it. Silly sensible brain. Wish I had bought a kit. I really enjoyed the whole experience of actually 'doing' rather than just seeing or being told how things were done. It made me feel more like I was connecting with the culture, rather than just observing it. There are lots of things to see in Indonesia, but if you're ever in Yogyakarta and are looking for alternative activities then I would definitely give these a try. You can still WIN an all expenses paid trip to the KOMODO ISLANDS!